Topher looked around for any other pug dogs in the room. There was one lady at a table off to the side, so he raised his paw to her. “Yeah, you know what I’m talkin’ about!” She nodded and smiled, looking embarrassed. But the Chihuahua man with her shouted out, “No kidding! No respect! None at all.” His pug lady friend looked even more embarrassed, and turned her face away. A small laugh from the audience. It was always good to start with self-deprecation, so he told a few more jokes about his height. Then he moved on: “I know you big dogs have it rough, too,” Topher said, going into the routine about his buddy, Frank the mastiff. It was usually pretty reliable and started gathering laughs after the first few punch lines. Unfortunately, not any tips. So, he told the airplane joke. A couple of the bigger audience members — a St. Bernard and a table of Greyhounds in business suits — grumbled affirmations. Finally, a big guffaw from the audience and the sound of change clinking in the tip jar. He needed that money, but why did it always have to be the cat jokes? At least there weren’t any cats here to hear them. That was one good thing about the “DOGS ONLY” sign on the front door. Now that the audience was warming up a bit, Topher thought he’d risk trying out a new routine. You never knew. It might be a hit. 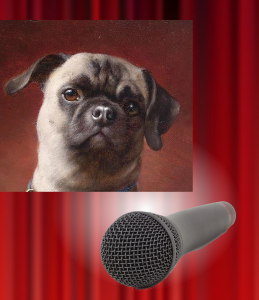 Some of the audience kept laughing, but a floppy-eared puffy-furred man at the bar stood up and stormed out. Topher wasn’t sure, but he guessed it was a Labradoodle. Why could dogs laugh at cats but not at themselves? Topher tried a few more routines, but he felt the audience growing colder and colder. He preferred to steer clear of the cat jokes, but he really wanted that money. For her. And, for himself, he really needed the laughs. The audience was looking excited now, hanging on his words, waiting for the next line. And, suddenly, the room was roaring with laughter. The world felt right again. The audience was in his paws, and Topher couldn’t help loving it. All those laughs. For him. A German Shepherd in the audience shouted out, “Yeah! What does that mean!” The rest of his table was laughing. “Don’t mean anything!” a Dalmatian threw in. The audience got really quiet, waiting to learn this secret. The audience was in stitches, and Topher felt the excitement and adrenaline pull him on. He told himself it was only for the tips, but he lived to work a crowd. “I came home the other day,” he said, “to find a cat burglar in my home. This cat was lying there with a big sack half full of my silverware, just taking a nap in a sunbeam.” Topher was loving the rhythm of his patter and the synergy he was getting from the dogs in the crowd. “See, that’s the problem with cats,” he said. “No work ethic. Sleeping on the job. What the heck man? Can’t you even do crime right? You know what I’m sayin’? No wonder they’re all poor.” He could almost forget the actual words he was saying, and just ride the waves of laughter. It got easier with every joke he told. “There used to be a cat mafia,” Topher said. “Used to be. It was a big failure. Problem is, you tell a cat he’s gonna sleep with the fishes and he thinks it sounds like a great evening. Two of his favorite things: sleep and fishes.” He knew it was a racist stereotype, but it was how all cats were depicted in the pop movies. Dogs liked it. It was good for the laughs. “Organized crime also requires organization,” Topher said. “And cats are biologically, no, physically incapable of being organized. You know what a cat meeting looks like? Ten cats all conspicuously not looking at each other. Nothing gets done!” Topher waved his arms for effect. The crowd was all nodding. “But a cat?” Topher continued. “Cats think it’s all about them. Just today, see, I order a beef-and-bacon sandwich — my favorite — and the cat waiter comes back with a tuna fish sandwich. Tells me he thought tuna fish sounded better to him today. I thought a different restaurant sounded better.” Which, of course, was the real reason why so few cats were successful business owners: dogs wouldn’t patronize them. A few dogs were literally rolling in the aisles. But as Topher wrapped his set up, he couldn’t help feeling like the rising unemployment rate among cats — already three times the rate among dogs — was partly his fault. Did dogs leave his shows and fire cats from their businesses? Or was he just reflecting what was already happening? He could never be sure, but, by the time he delivered his closing line, Topher felt dirty. Maybe someday, when he was famous, Topher could change his tune and make a difference. For now, though, he waited anxiously for the bar to close. The Afghan Hound manager wouldn’t let him count his tips until everyone was gone. It looked too tacky, the Afghan claimed. “Here ya go,” the manager finally said, after the last customers left. He handed the glass jar stuffed with coins and bills into Topher’s waiting paws. Topher poured the contents out on the bar top and counted them up. The higher the count got, the faster his heart beat. “Oh, yes,” he said. Topher nodded, still looking down at the money. He kept counting, again and again to be sure. “Do you think your girl suspects you’re going to ask her?” the manager asked. Topher pawed his money into one pile, and stuffed it in his wallet. “That’s a good one,” he said, wagging a paw pad at the manager. “You should use it in one of your routines,” the manager said. Topher grabbed his coat from where he kept it stowed behind the bar and headed for the door. “Yeah, I’ll think about that,” he said with just the right level of sarcasm to make his manager laugh. “See you Sunday,” he said, and then he headed out into the night, his hard-earned money in his pocket. The walk to Moe’s 24-Hour Pawn Shop was not through the nicest part of town. Topher always felt nervous walking among the boarded up apartment buildings, dark alleys, and convenience stores fortified with iron bars. Small dogs have to be careful when walking alone at night, and, tonight, he was carrying a lot of cash. At least he wasn’t a cat. Most thugs would think twice before attacking a dog; but crimes against cats were rarely prosecuted. So they made safe targets. With only a few blocks left to the pawn shop, Topher saw a dark figure ahead, walking toward him. It was probably nothing. He wondered if he should cross the street to put a little extra distance between him and the figure. But that might attract attention. He decided to just play it cool. Hope for the best. “Excuse me, which way is Elm Street?” the dark figure asked, stepping into the light of a streetlamp. It was a towering Rottweiler woman, holding a crumpled map and looking very lost. Large, but not at all threatening. “Oh, um, it’s, er–” Topher stammered. “T-Two blocks that way.” He waved his paws in the general direction. As long as he was on stage, he could handle anything. But alone, on a dark street, out of his element, his hammy confidence vanished and only his introverted nature remained. That’s why he liked being on stage. “Thanks.” The Rottweiler walked off into the night. Topher breathed a sigh of relief. He knew that cats had it harder, but Topher sure wouldn’t have minded being a larger breed of dog. Maybe a bulldog. Or a mastiff. Then he’d still look like himself — with the flat face and handsome jowls — just writ large. Topher arrived at the door to Moe’s pawn shop and pushed the buzzer. Moe looked down through the barred-up windows of his apartment above the shop. He was a terrier mutt, not much larger than Topher, with a bearded face and flop-tipped triangular ears. The door to the pawn shop opened for him, and Topher stepped through. As soon as Moe latched the door behind them, Topher fanned out his cash for Moe to see. Moe shook his head. “Weird choice, Topher. I wouldn’t want ask a girl to marry me with an emerald ring. She’ll have to wear that thing every day! And green sure ain’t a color that goes with everything.” He shuffled back to the counter, pulled out a box, and started digging around through the shiny little circles. “She better like green a lot.” He held up the ring, and the green gem caught the light. Topher thought, it’ll match her eyes perfectly. But, he said, “Yeah, well, I’m not a color that goes with everything either.” He held out a paw, and Moe let him take the ring. Topher paid for it, but except for the lighter feel of his pockets on the way home, he wouldn’t have known. He was too busy floating on air, his brain buzzing with all the different words he could say, all the different ways he could possibly ask her. His apartment was quiet and dark when he got there. But it wasn’t lonely like it always had been before Lashonda moved in. He could see the shape of the gaudy, stained-glass lampshade she’d brought with her. It always made Topher think of little old grannies with knitting needles, but Lashonda loved it. All of her photographs — mostly of the two of them together — were lined up on the mantle in those tacky, cutesy frames, decorated with pewter hearts and daisies. Most importantly, though, Topher knew that behind the quiet and dark, Lashonda was sleeping peacefully, waiting for him to return. Topher shed his jacket and went into the bedroom. He saw his love stretched out on the bed with the covers pulled over her. Moonlight from the window glinted off the black fur of her ears; it caught the gossamer tendrils of her whiskers. An ear twitched, and she shifted under the covers. Topher sat down on the bed, still clutching the ring in his fist. He’d worked out the words he wanted to say, but simply looking at Lashonda’s feminine, feline beauty took his breath away. She said that now, but Topher had seen her cut dogs down with a single, sarcastic word when they dared disrespect her. He would never dare tell his standard cat jokes in her presence. Lashonda reached her velvety paw out, claws daintily retracted, and stroked his arm. “No one who really knows you could believe you hate cats.” She purred, deep in her throat, and kneaded his shoulder lightly, possessively with her claws. It sent shivers down Topher’s spine. Lashonda’s ears twitched in a complicated dance that Topher couldn’t pretend to comprehend. “I wish I could come to one of your shows,” she said. Lashonda flattened her ears. “I wasn’t kidding. Now, tell me your joke.” She could have ordered him to dye his fur green to match her eyes in that tone, and he would have obeyed. Her eyes focused on him more piercingly than any other audience. The dancing laughter in their sparkling shades of green was the greatest high he’d ever felt. Topher could have spent the rest of his life telling jokes to her. He hoped she’d give him that chance. She flattened one ear and tilted her head, but she was holding his paw tightly. It was probably only seconds that passed, but Topher knew that was more than enough time for her to think circles around him. She’d done it in the past. “Well,” he admitted, “It has a limited audience.” His heart was in his throat, but he tried to focus on the smooth feel of her paw pads intertwined with his own. The seconds ticked by like eons as Lashonda stared down at their intertwined paws, black and tawny fur pressed together. He wanted to know what she was thinking, but he was scared of what he’d find out. When she finally looked up at him, Lashonda’s green eyes shone from the darkness of her black-furred face, and her mouth twisted into a mischievous, mysterious smile. Topher loved that smile. “Lashonda,” his beautiful black cat answered him. “Lashonda Brooke,” and as she took his name, she also reached out and took the emerald ring. It matched her eyes perfectly. She’d already taken his heart. Next Next post: Furry Book Month!